Thank you to several other blogs for assisting with the promotion of this giveaway. supplies in the US with its office in Long Beach, CA. to ensure that they carry the latest printing supply products. 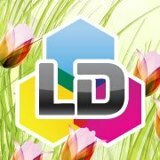 I was thrilled to be contacted by LD Products to write a review for them. Who doesn't have an interest in printer ink nowadays? I have a laser printer and an inkjet printer - for this experiment I worked with the laser printer which is a Brother HL-2270DW. So let's start with a price comparison - Since it is laser it needs a drum cartridge. The drum cartridge at "a leading retailer" is $109.99 with a toner cartridge cost of $68.49 for a total of $178.48. But by purchasing (although I did receive it for free in exchange for this honest review) through LD Products it would have cost a total of $38.99 for the drum and $25.99 for the toner for a total of $64.98. That is quite a savings and I can think of many things I could be using those extra funds for. A 64% Savings. Their remanufactured ink produced results just as clear, precise and defined as the brand name cartridge I had been using. I did not have to compromise anything in quality. Although I have not been using it long enough to determine - I cannot imagine I would suffer at all in quantity also. Although I did not receive ink for my Epson Inkjets I do want to run a comparison for the inkjet ink for you to see it in print also. The Epson Workforce 545 has multiple cartridges in it. To replace all of them through a "leading retailer" the total cost for three black cartridges and two of each color high yield (3 colors) would be $161.91 but through LD Products it would cost just $56.97. A 65% Savings. So if you are spending your hard earned cash on ink - fret no more. You can save a considerable amount with LD Products. I received some remanufactured ink in exchange for an honest review.